Cut 1/2 inch off top of tomatoes. Remove pulp from tomatoes. Turn tomatoes upside down on paper towel to drain. In a bowl, combine remaining ingredients except green onions. Spoon salad into tomatoes. Chill until ready to serve or serve immediately. Just before serving garnish with green onions. Enjoy! 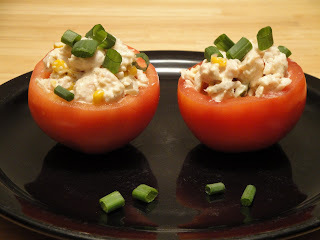 I love serving chicken salad in an edible container...so lovely in the tomatoes, Christine! This sounds great as usual, Christine! I love this one! Just turned on the computer and your lovely little bowls of tomatoes filled with chicken popped on my dashboard. Very pretty! This is fantastic, Christine! I love that you included some interesting facts. Looks great! I love stuffed tomatoes! oh wow, they look really good and healthy at the same time! Christine, I always forget about stuffed tomatoes in the wintertime -- thanks for the colorful reminder! Your chicken salad filling sounds delish and your photo is lovely. Buzzed! Creative idea of using tomatoes for a holder for chicken salad. It sure does beat using sandwich bread. This looks like a serving from the tea room! Great post. WE just loved stuffed tomatoes great job! Such an intreresting article! Love the recipe too. I love stuffed tomatoes. Looks great. Thanks for all the amazing comments, I just love hearing from you. We love these at my house! I envy your being able to get good tomatoes at this time of year...this would make a perfect lunch or light supper. I love stuffed tomatoes but I usually use tuna. Chicken is such a great way to make this. I am always a fan of using fruit or vegetables as a edible container! This sounds like a great light brunch recipe, I will have to try it soon! Stuffed tomatoes are the best...these look very yummy! I love stuffed tomoatoes! And every time I visit your blog I learn some food facts...totally love that! Oh yum! What a lovely recipe. Thanks for sharing.